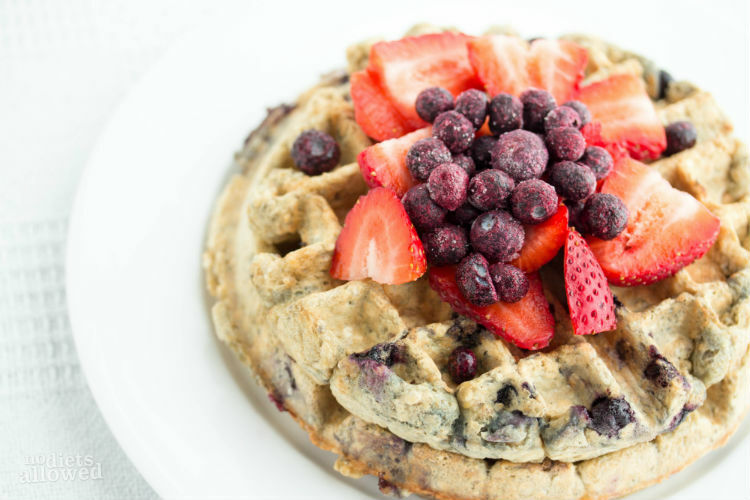 Ooooh, blueberry waffles. How I love you. Light, fluffy with blueberries bursting in your mouth… you’ll actually jump out of bed in order to make these. Breakfast is by far my most favorite meal of the day. If you’re a breakfast-skipper, you’re missing out on so many health benefits! 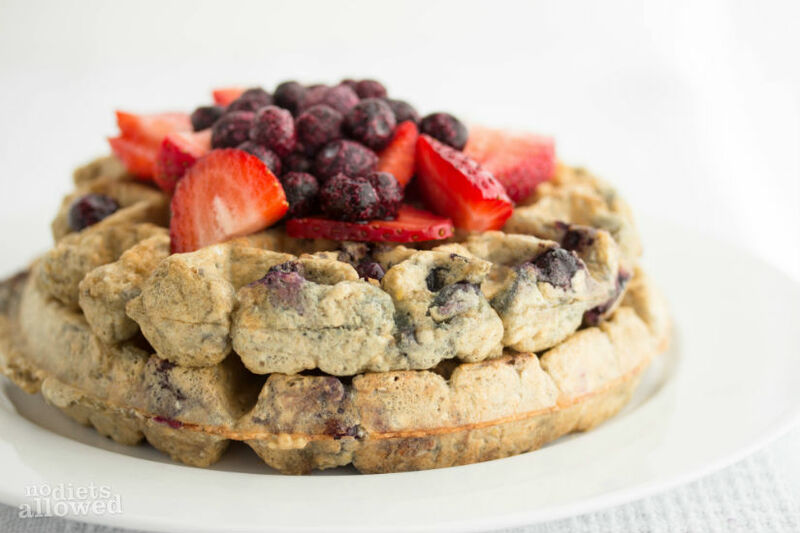 Eating breakfast, like these gorgeous healthy blueberry waffles, improves mood, concentration and performance, lower cholesterol, influence weight loss, and increases strength and endurance. If you’re short on time in the mornings, double the batch and refrigerate the leftovers. 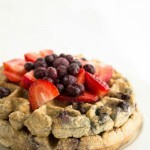 Then all you have to do is heat up your waffle iron and scoop on some batter. Spread on some coconut oil instead of butter or margarine and then pour on some pure maple syrup (definitely read the ingredients!) topped with some berries and viola! If you’re wanting more quick, easy, and healthy breakfast options, my Breakfast Quiches are super popular. I make two dozen for my husband, he refrigerates them at work, and heats 3 to 4 up for a quick, protein-packed breakfast. I have lots of great breakfast recipes because… well, I’m addicted to breakfast. Stick with me, and I’ll convert you to loving breakfast too. I know, I know… but in case you have missed my plug for whole wheat pastry flour, here it is on Amazon. I’ve also seen it at Winco and Target. Add milk into dry ingredients and stir until batter is moist. Fold blueberries into batter.